If you’re like me and one of your vices is the love and borderline addiction of sweet tea, as a true Southerner and self-deemed aficionado of the brewed greatness, I have to share an excellent new find I stumbled across a few Sundays back, while visiting the Mueller Farmers Market (4550 Mueller Boulevard at the Browning Hangar) here in Austin, that being the one and only, Moonshine Sweet Tea. Thanks to the kindness of Joele Porter, 4th generation Texan and the great grandson of Leo (Cobb) Porter, who first came up with the sweet tea recipe way back in the 1940’s, I fed my habit, plentifully sampled and was, subsequently, blown away by the incredible taste, uniqueness and flavor of Moonshine. Let alone, the out-of-the-ordinary manner by which the tea is concocted. Cannot recommend this product enough! To better explain, you really need to get the background. An extremely friendly, personable guy and fellow New Orleans Saints fan, Joele was cool enough to share his family’s story regarding Moonshine and how the product has now been brought to the marketplace here in Texas, which I pass along to you below. 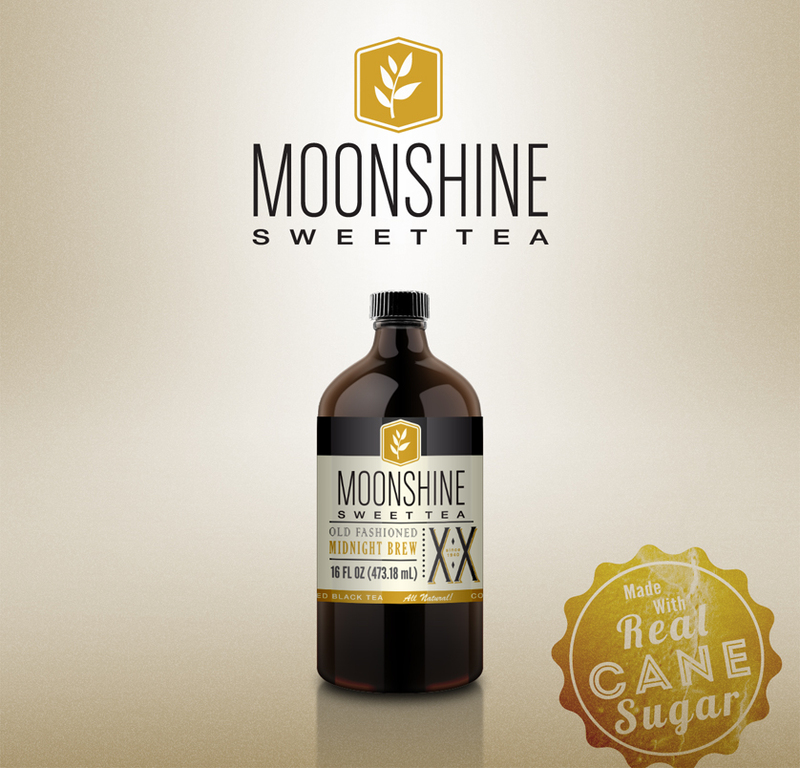 I also recommend you check out the Moonshine web site – www.moonshinesweettea.com – and Facebook page – www.facebook.com/moonshinesweettea. Our family had always made a sweet tea concentrate and kept it in the refrigerator. It was a staple in our household and we never gave it much thought. All our friends and family loved the tea and every time someone came over, they always asked for tea. My grandma learned how to make this tea from her husband’s family. That was over 50 years ago. We don’t know how long ago my great grandfather’s family started making this sweet tea concentrate. It was at least as far back as the 40’s in Mason, Texas. Having the tea in a concentrated form took up less space in the refrigerator. You could make a glass as strong or as weak as you like. The concentrate can also be used to make a cup of hot tea. Also another big plus is the tea can be kept in the refrigerator for weeks and does not get cloudy and you always have fresh tea each time you make yourself a glass. People began telling her that she ought to start selling the tea. After many of our friends kept asking for tea and telling us we needed to sell it, I decided to market it myself. My grandma never wanted to deal with all the things associated with selling the tea. In 2009, she gave me her blessings and said she would help me get started and help me make tea. 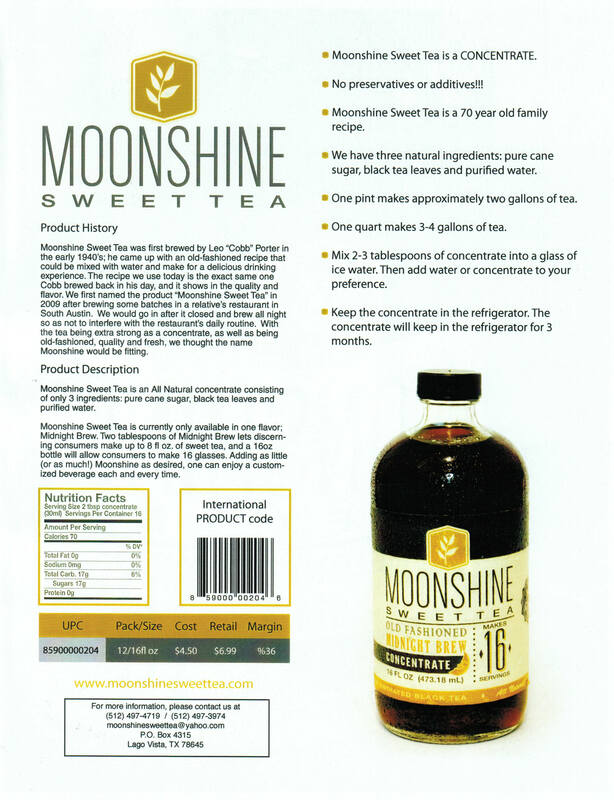 “Moonshine” was selected as the name while working late in the commercial kitchen brewing the first gallons of tea concentrate for the public. A family member’s restaurant was used after hours to avoid interfering in the daily routine of the restaurant’s business.